This villa has one of the coolest views on St. John - you can see the ocean, the western side of the island, and St. Thomas all from your pool deck. Both bedrooms open to the balcony, and the pool is super private thanks to all the surrounding vegetation. This villa has a great setup that’s perfect for a family vacation, couples trip, or romantic getaway. Exotic View Villa is a two-bedroom villa near Great Cruz Bay on St. John’s south shore. This family-friendly villa is surrounded by tropical gardens, vibrant sunsets, and views of Pillsbury Sound, St. Thomas and the Caribbean Sea. Exotic View has an infinity edge pool with a trickling fountain and panoramic views. Loungers line the deck, and a BBQ grill sits at the head. Upstairs, there’s a balcony with stunning views of the sea and the hillside. There’s space for guests to dine and relax, and ceiling fans keep the area cool. Sliding glass doors open into the Great Room, where guests can dine around the glass-top table, watch TV from the couch, or cook on stainless steel appliances in the kitchen. The living room has board games, books, and an entertainment center with a flatscreen TV, CDs, and a DVD player. There’s a breakfast bar, coffeemaker, and high ceilings in the kitchen. Off to the side, there’s a washer and dryer for guests to use as they wish. Both of the spacious, air-conditioned bedrooms have king beds, ensuite bathrooms, flatscreen TVs, DVD players, and access to the balcony. There are blinds to roll down for afternoon naps, and large dressers so guests can move in for the week. This villa is only a 10 minute drive from the North Shore beaches, and 5 minutes from restaurants and groceries. The villa is on the most developed side of St. John, so there’s plenty to explore. A 6-min. drive from Cruz Bay and just 10-12 min. drive to the spectacular Northshore Beaches! Stays of less than 7 nights require a $150 cleaning fee. The villa was perfect for our needs and, as advertised, the view is outstanding. It was very comfortable and had everything that we needed for a day at the beach. We experienced a power outage and when the power came back on, the water pump did not work. We called the island representative for WhereToStay and Alfredo arrived very shortly to fix the problem. The house was perfect, and the level of service from Shawna and others at WhereToStay was top-notch. We would highly recommend them and Exotic View Villa. The villa was amazing! It’s very close to the town of Cruz Bay, less than a 5 minute drive. The villa itself is exceptional, with awesome views and two huge air-conditioned bedrooms. Each suite has its own bathroom with a double sink vanity and walk-in tile shower. The kitchen is modern and big, and the back balcony is a great place to soak in the view, grill and eat. The pool on the lower deck was clean and deeper than most villas’ splash pools. The deep end is 6 feet deep. We will definitely be booking this villa on our next St. John trip. Shawna was extremely helpful. Anytime I called she had the answers I needed and made booking a breeze. She helped me with the trip insurance as well when I had trouble securing that. Beautiful views and villa! Very convenient to town. 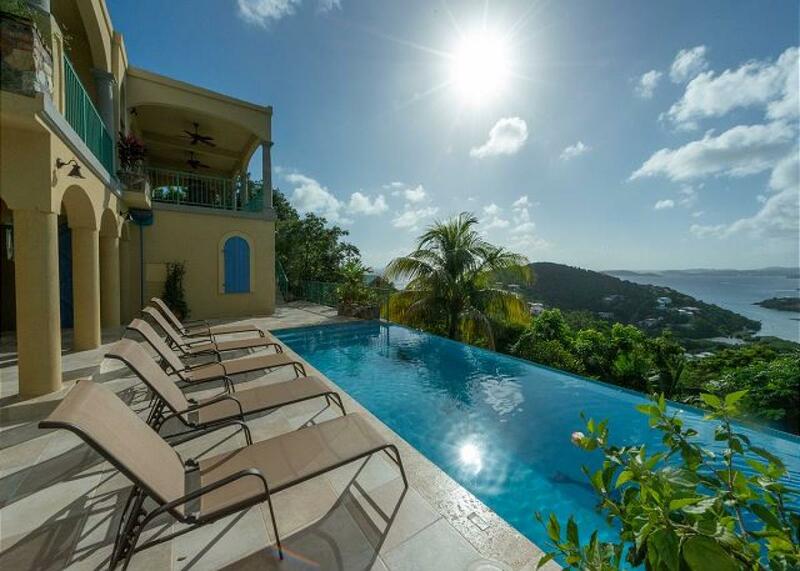 Exotic View Villa has great views of St Thomas, the sunsets, and Cruz Bay. This villa is top-notch, clean, and cared for. This is our 6th visit to St John, and this villa was by far the nicest we’ve been to. It was clean, pristine, and everything was in order. The villa management team was always available, quick to answer questions, and eager to respond to any needs. Sherrolynn, Alfredo, and Maria were awesome! We called to have the gas container changed on the grill and Alfredo was there in 10 minutes! We would return again and had a peaceful, relaxing vacation while staying here. The furnishings were excellent, with a comfortable king bed and everything needed for closets/dressers/etc. It had a top of the line kitchen that was beautiful and equipped with anything we needed for cooking, drinks, and space. Working with Shawna was a pleasure, and she was always willing to answer any questions to make sure we were comfortable with our trip plans. She stayed in contact before, during, and after our trip to make sure we were happy and that all questions answered. I appreciated Shawna’s knowledge of St John, and she knew exactly what we were looking for to match us with the right villa. Beautiful garden villa with an amazing view of Cruz Bay in St. John. Exotic View Villa was absolutely everything we wanted for our stay on St. John to celebrate our anniversary. From the beautiful garden courtyard to the breathtaking view of the bay from the pool, every part was beautiful and cozy. Everything was modern and well thought-out. We loved the patio in the back and enjoyed breakfast and several romantic dinners while watching the sunset with villa provisioning by Sam and Jacks. It was a perfect way to end our days. Every window offered a beautiful view of either the front garden or the bay and ocean. The kitchen had everything you could possibly need and plenty of room. I recommend villa provisioning for mornings out on the patio. The pool also had a wonderful view and was a great place to watch the sunset. We enjoyed the provided beach chairs and cooler for our trips to the beach. There is plenty of room for two couples traveling or for a couple looking for a romantic getaway. This was our first time to stay in a villa and not an all-inclusive resort. I think we will always do a villa now. Having the privacy and room was perfect. We were only a short drive away from restaurants, groceries, and the North End beaches. It was very quiet, peaceful, and offered privacy. Exotic View Villa offered the perfect accommodations for a much needed romantic trip. We booked with Shawna a year before our trip after doing extensive research. Shawna was very helpful with finding a villa that matched our interests and what we were looking for. Even after Hurricane Irma and Maria, Shawna was very helpful and answered every question I had during an uncertain time. I loved how she was always quick to respond to my questions and very thorough. She provided many helpful tips and suggestions, and handled booking our transfers and car rental concerns. During our travel day, we experienced long delays and she was quick to respond to my emails. She also kept the car rental and our villa greeter updated on our flight situation. It gave me such peace to know she was looking out for us and our travel situation. I will definitely book with WhereToStay again. Everything was top-notch and we had an amazing anniversary trip on St. John. This villa had it all - modern kitchen, renovated bathroom, and air conditioned bedrooms… but the BEST was the view of the water and St. Thomas from the deck and pool. So relaxing during the day, lit up and sparkling at night. Exactly the romantic getaway we were looking for. Working with WhereToStay was easy and seamless. 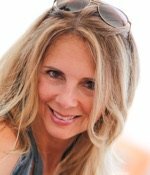 Shawna found a great rental, and provided excellent recommendations for restaurants and other amenities. I would have liked to know in advance that stocking the villa needed a 72-hour order. But we pre-ordered groceries anyway and they were waiting at the market when we arrived. We had a great week! Our greeter was wonderful and accommodating when our flight was delayed. The villa was as beautiful as the pictures! Views were amazing! We loved spending mornings on the patio and the pool was perfect. The kitchen had everything we needed for cooking. While the island breezes were great, I would recommend adding air conditioning to the main living area. The bedrooms had air conditioning and were very roomy and comfortable. If we go back to St John again we will definitely rent Exotic Villa again. Highly recommend!! Sharon was very responsive and helpful from the beginning of the process until we left for vacation. She took time to answer my questions whenever I called and made planning the trip very turnkey. The taxi service she set us up with, Wheatley Taxi on St Thomas was wonderful. Would definitely recommend to others. Drivers were very nice, helpful and knowledgeable on the islands. Exotic View has wonderful proximity to Cruz Bay, and is a lovely home. It offers great privacy for two couples. The restroom and mini fridge by the pool could be improved so there was less need to go up and down the stairs, and the driveway access is extremely rough. Other than that, it’s a wonderful home. Shawna was great and very helpful. Her written instructions were detailed and well-done.